If you liked the Facebook “Like” button, then perhaps you’ll like the new “Send” button, as well. We implemented Facebook’s new “Send” button on all our posts and pages, enabling travelers to send their favorites to Facebook friend’s Facebook inbox, email or to selected members within a Facebook group. The idea is that you may want to share certain information — if you are planning a trip with friends or a group, for example — but perhaps you don’t want to distribute the information with all of your friends. 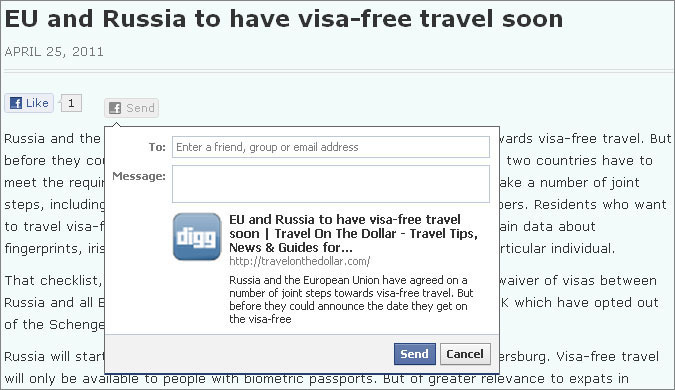 Social travel planning site Gogobot and travel booking site Orbitz, too, implemented the send button, as did some 48 other websites at launch of the new Facebook button.